← Divorce Mediation: Who is it For? Divorce is a difficult time. But it need not be a hopeless time or a helpless time. Divorce is a period of change, but it need not be all anger and pain. Frank and I are starting a new series of free public presentations geared toward life after divorce. Divorce is the end of a relationship; it is also a time of opportunity: opportunity to grow as an individual, to recognize our mistakes of the past and open ourselves to being the person we have wanted to be all along – perhaps creative, perhaps more loving. Maybe we have never taken the time to learn what it is that would really fulfill us in life; never gotten to know who we really are. This is our goal: to look at life after divorce as an opportunity, an expansion of what is available to us in life. While discovering ourselves is so important, if we have children, we want to recognize that this new period in our children’s lives is also full of opportunity – a chance to share mom and dad without the pain of constant fighting, anger and being put in the middle. The first presentation in our new series is geared toward Parenting Partners – All About the Children. 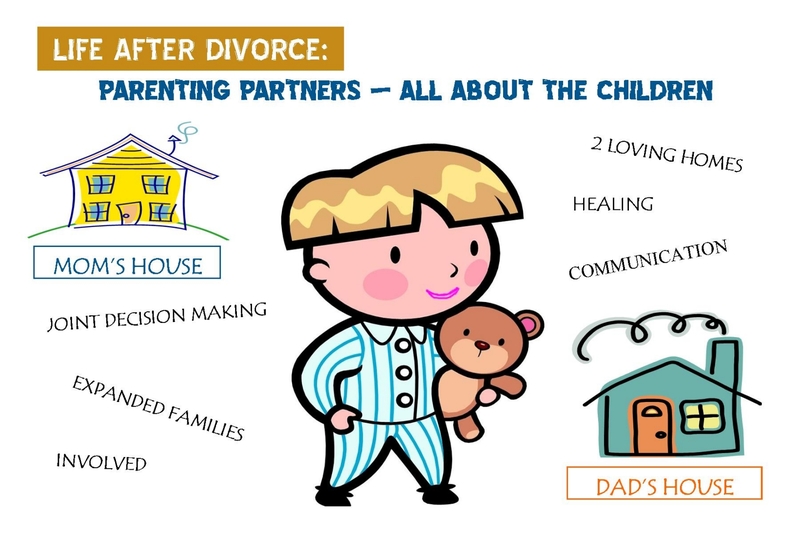 It’s about mom’s house and dad’s house, about joint decision making by parents who are focused on their children’s needs. It’s about creating a brand new world of improved communication, growth of the human spirit and creating two loving homes for the children to thrive in. When mom and/or dad remarry, the family expands and new opportunities and challenges present themselves – so we will talk about how to help you and your children grow through through this experience. Above all, children need committed parents in their lives – parents who play with, comfort and express love so the children have a chance to grieve their losses and be open to new opportunities and challenges as they move forward in their altered lives. Please join us for this presentation. Light refreshments and coffee will be provided.